The UN Security Council delayed a vote on a ceasefire to allow aid to civilians in Eastern Ghouta as the Syrian government continues its bombing of the besieged area. 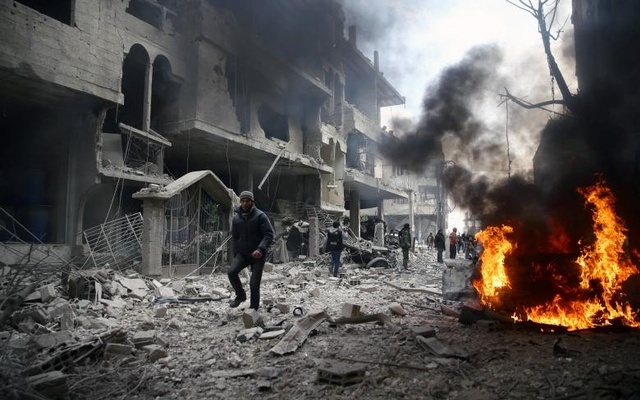 The Syrian Observatory for Human Rights said that a week since the launch of the bloody campaign on Eastern Ghouta over 500 people were killed and hundreds more injured. The scale of the attacks from barrel bombs and other missiles was making it hard to find and count the dead, rescuers said. Doctors and medical activists from around the world called for an end to the violence, protection for civilians, and greater action from the UN, in a joint appeal published in the Lancet. Intense talks at the UN headquarters in New York followed a direct appeal Friday by French and German leaders to Vladimir Putin for Russia to support a ceasefire, but a vote was pushed back several times as talks stalled. Written by: Jaber Ali on February 24, 2018. Posted by Jaber Ali on Feb 24 2018. Filed under Headlines, World News. You can follow any responses to this entry through the RSS 2.0. Both comments and pings are currently closed.